If only the Raiders had five Rodney Hudsons up front. Hudson, the veteran center, has been his typical, Pro-Bowl caliber self this year, even in the midst of a 1-7 travesty of a season. Hudson is one of the NFL’s best pass blockers. 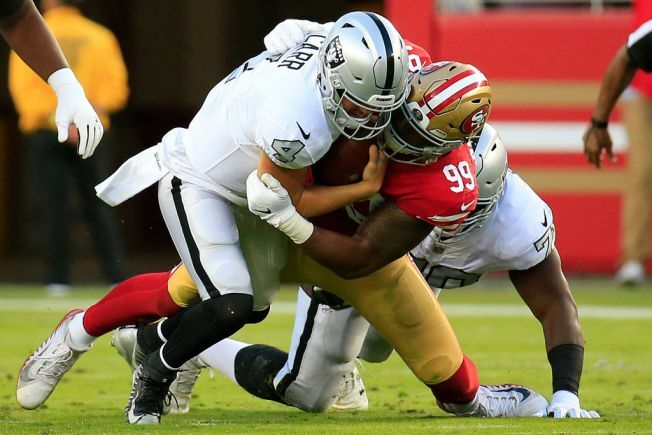 His pass-blocking grade is the highest at his position in the NFL this season, according to the analytic website Pro Football Focus, and he hasn’t allowed a single pressure on quarterback Derek Carr in seven of eight games in 2018. But the offensive line as a whole isn’t giving Carr much time at all to look downfield, much less complete throws. In eight games, Carr has been sacked 24 times. He’s on pace to be taken down more than in any other year. In 2015, Carr was sacked 31 times in 16 games, a career high. In 2016 he was sacked 16 times total. Last year, 20 times. This season, defenders are getting to Carr in a hurry. Former NFL quarterback Kurt Warner, a Hall of Famer, said Carr is under duress almost every time he tries to pass. In a loss to the 49ers in Oakland’s most recent game, Carr was sacked eight times. The offensive line has been hurt significantly by injuries. Guards Kelechi Osemele and Gabe Jackson have missed games or played through pain. Right tackle Donald Penn has missed several games and rookie left tackle Kolton Miller could hardly move for a couple of games because of a knee problem he's still playing through. Backups have had their problems – and more injuries – while filling in. Head coach Jon Gruden says “no doubt” all the pressure is impacting Carr’s performance. But, he said, it’s up to the players and coaching staff to make adjustments and make things better. On Sunday, Carr likely will be under pressure again from the 6-2 Chargers, who have 22 sacks as a defense this year. The Chargers sacked Carr three times in their earlier meeting this season, a 26-10 Chargers win. Kickoff for Sunday’s game at O.co Coliseum is set for 1:05 p.m. The Chargers are listed as 10-point favorites by oddsmakers.